The StatLock PICC Plus w/Foam Anchor Pad, Sliding Posts offers great versatility and ease of use. 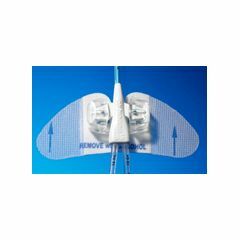 Combining the latest in design and engineering technology, StatLock® PICC Plus Device releasably secures most winged–catheter on the market. No clamp is needed to secure the catheter; no instrument is needed to remove it. Just lift the transparent StatLock® Device's “gull–wings,” place catheter wings over post, and close. Now it is easier than ever to reap the proven clinical benefits of the StatLock® Stabilization Device. Also available in by the case. Required for my picc line. I use the statlock because that is the product that the hospital used to hold my picc line safely in my arm. I have to replace the dressings weekly and need to continue using the statlock. It works very well for it's intended purpose. It is very durable and once it's on there it stays perfectly. My only concern is that it's on there so good when you go to change it out it's a little difficult to get off your arm without moving the catheter at all. Also, the sliding post statlock seems to be a bit more comfortable than the fixed post, so I recommend the sliding post. I have several Statlock PICC plus catheter stabilization devices. Is the expiration date on front of package? How long after date can they be used? Asked on Aug 23, 2012 3:56:24 PM by HOB from Lexington Ky.
Can you use this device on a suprapubic catheter?